The race for the Stanley Cup is on. The Playoffs started Wednesday with 16 teams in the hunt. All of the “Original Six” teams made it this year, except for one, the Toronto Maple Leafs. With the amount of pride Canadians have for their hockey teams, this surely comes as a blow. Well here at All About Cards, we feel a responsibility to ease the burden of our good neighbors to the North, the only way we know how, by bringing free hockey card to the city of Toronto. In minutes, I will head to the airport to catch a flight that will take me to the largest city in Canada. I will pound some pavement in Toronto, looking for someone to help us with a Canadian version of our newest feature, the STREET-break™. 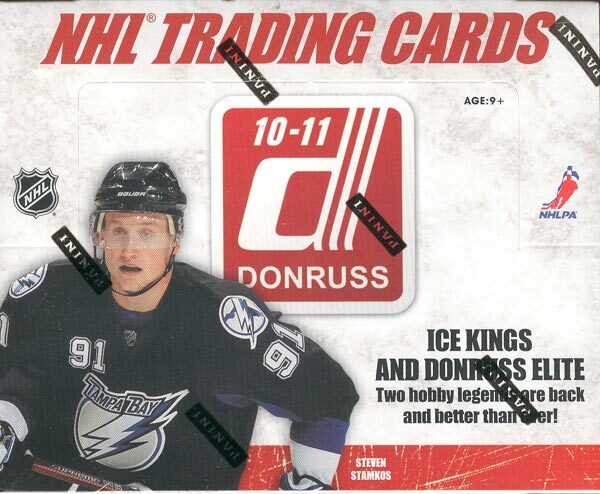 Thanks to the good people over at Panini America, we will be doing a box break of 2010-11 Donruss Hockey and whoever is willing to help us with the break will be keeping all the cards, an entire hobby box. So stay tuned to the blog and be on the lookout for more information about the break. It was indeed a blow, but an oft-repeated one to which I'm starting to get numb. I can't get downtown, but good luck with the break.